Not just another compilation. 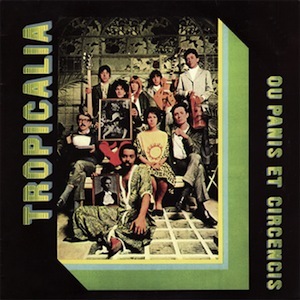 Tropicî¡lia, or Tropicalismo, was at once a response to military dictatorship and an attempt to expand Brazilian music by infusing ideas from all parts of the globe, even so far as an attempt to create a ‘universal music.’ This monumental compilation is the work of a like minded collective – radicals that would subvert and forever change the art and politics of Brazil, specifically Gilberto Gil, Caetano Veloso, Gal Costa, Tom Ze, Nara Leao, and Os Mutantes. Leaders of the movement, Gil and Caetano, would be imprisoned and exiled for 4 years because of this record. You can hear/feel their urgency in the music itself. Despite one’s comprehension of Portuguese, this is music that communicates regardless of the language barrier. It’s a sound to make your eyes drop back in your head and swirl: a stirring blend of American psychedelia, traditional Brazilian music, African popular music, and English pop rock. Taken in by the rhythms and growingly addictive melodies, you will find yourself singing along in pidgin Portuguese before long. The title of this record translates to “bread and circuses,” a phrase denoting cheap political handouts used to gather support. Makes me imagine the music was probably just an amusing distraction aiming listeners towards some higher cause. Regardless of your interest in the social importance of this record, I suggest you take the handout – it’s unlikely you won’t be carried away with Tropicî¡lia’s drama, intensity, stylistic range, and irresistible rhythms. It’s unlikely you won’t get carried away? Bad way of saying check it out.